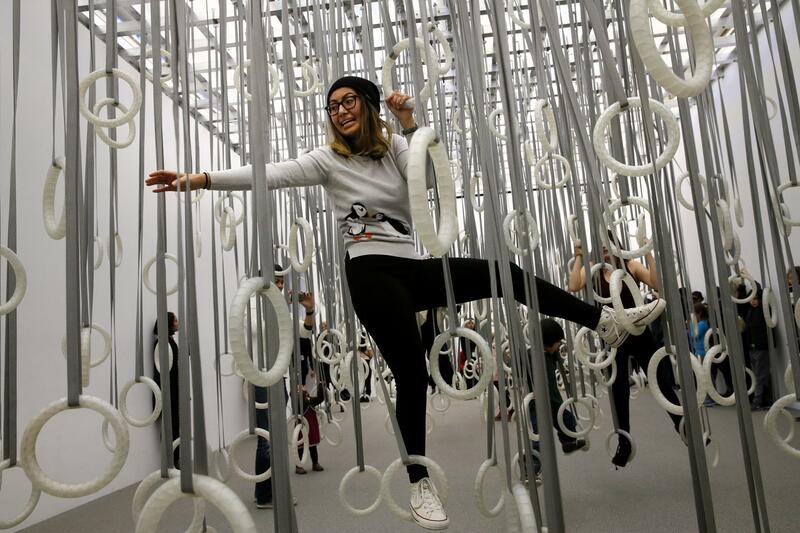 Paula Suarez, of Malden, uses rings to cross the room in “The Fact of Matter” while visiting “William Forsythe: Choreographic Objects” at the Institute of Contemporary Art. William Forsythe’s “Choreographic Objects,” which opened earlier this month at the Institute of Contemporary Art, is the rare art exhibition that comes with an explicit personal injury liability waiver. Read the fine print on the wall (if I may paraphrase): Do as you like (unless you’re 6 or under), but don’t blame us. This one’s on you. A step or two into the show, you’ll see what I mean. Past the very first gallery, where Forsythe’s “City of Abstracts” conjures life-size liquefied apparitions of viewers that trail their every movement in a creepy funhouse-style simulation, you land in “The Fact of Matter.” Let’s take that literally, for the moment: A forest of odd-length nylon straps, each trailing a sturdy gymnastics ring, makes the proposition obvious enough. Obvious, though, doesn’t mean easy. Grappling with rings of varying heights, I pitched abruptly from vertical to horizontal and found myself dumped roughly back on the ground. 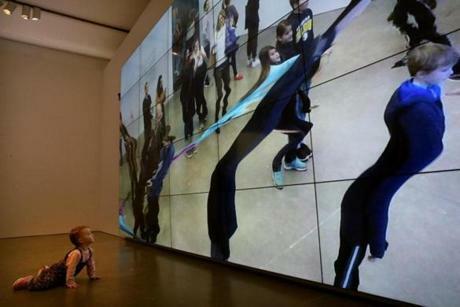 Olive Wilson, 2, views “City of Abstracts” in the ICA’s William Forsythe exhibit. The fact of the piece, most bluntly, is that gravity always wins, though the couple of dozen people waiting to navigate it gamely proved the victory to be one of degrees (one young woman I saw climbed nearly to the ceiling before lurching abruptly almost upside-down, her boot caught in a ring; she was lowered down by her very alert boyfriend). How far you can get before the inevitable surrender is hardly the point. With the piece, and the show, Forsythe performs the trick of creating both a circus — a popular one; when I was there on a rainy Tuesday afternoon, the place was all but packed — and a space for contemplation. Works here interrogate, mostly gently, elemental ideas about human nature, physicality, and museums themselves. That last one’s a biggie. For a museum looking to surrender at least some of its authority to its audiences — a broadening ethos in a traditionally top-down realm — “Choreographic Objects” is heaven-sent. It immediately makes the gallery-going experience dynamic, not static — no squinting impassively at images on walls here, wondering what to do next. It also, as Forsythe told me, puts the experience almost entirely on the viewer’s shoulders, liability waiver or not: Without participants, “Choreographic Objects, minus a couple of video pieces, is really just objects, waiting for someone to do something. These are some of the big ideas museums all over are grappling with as they contemplate, in the social-media lingo of the moment, “audience engagement” strategies. Forsythe, meanwhile, a choreographer of international renown, need make no such calculation. He comes with engagement baked in. Most of these works are nothing without you, and he’s the first to say it. “[The audience] really is the subject, and their desire to know is the subject,” said Forsythe, as gregarious and playful in conversation by phone from his home in Vermont as his work would suggest. And while there’s a hint of a ringmaster at play in Forsythe’s good-natured invitations, don’t mistake his guidance here for directive. That’s an old art-world code spilling into the new. Maybe. Or maybe it’s that the invitation, for the most part, is too delicious to turn down. After battling with the rings — yes, I tried again, made a little more headway, and left, grateful to have my rotator cuffs intact — you’re guided through a two-channel video piece of Forsythe seeming to defy gravity, fluidly negotiating the space between and within a pair of tables (the camera was positioned to suggest his movement in air, when really he was sliding along a well-buffed hardwood floor). This brings you to “The Differential Room,” new this year, where a set of chalkboards describe a series of movements you, the viewer, can take or leave, though most seemed to take them. 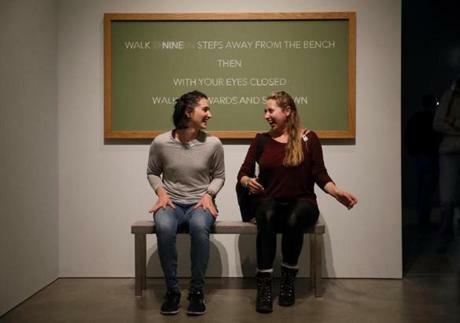 The plainspoken instructions — “Walk Nine Steps Away From the Bench / Then / With Your Eyes Closed / Walk Backwards and Sit Down” — seem to name-check old school Conceptualism, when artists like Sol Lewitt or Lawrence Weiner would offer instructions, not artworks, as a way to undermine the dominant notion of art being the exclusive product of singular genius. Where that gesture was anti-art, or at least anti-art-object in its ur-democratic intentions, Forsythe’s work is less subversive than it is oddly liberating. To me, “The Differential Room” reads as a set of gentle dares: not to defy established art-world orders so much as your own comfort zone, whether in a museum or anywhere else in the public realm (unless lying prone on a patch of felt while others watch you try to get up without the help of your hands is part of your daily routine, and if that’s the case, more power to you). That’s the thing: Where Conceptualism liked, for the most part, to have conversations with itself, Forsythe is far more interested in having a conversation with you. Negotiating your body through the set of challenges and restrictions he lays out is very much the kind of dialogue a choreographer, with obvious priorities on the physical, not to mention its limitations, would favor. (Futility, both as a theme and a constant companion, looms large here.) “The Fact of Matter,” more than any other piece here, separates your body and your mind to force a renegotiation between the two. The contract that makes easy movement suddenly needs to be rewritten — though, I can say from experience, not quite fast enough. But in those physical challenges rest bigger ideas — about the things we take for granted, and our complacency about the everyday. The absurd proposition of “A Volume, within which it is not Possible for Certain Classes of Action to Arise” — the title nearly says it all, but importantly, not quite — is one of those. A massive cube of drywall looms in the gallery, as though the ceiling had been dropped down to a height of just a couple of feet. Drop down, slide under (not for claustrophobes, trust me) and crawl your way to the small exit slip at the far corner, and you’ll know quite literally in your bones that the piece is about restriction — the many things the piece makes ‘not Possible,’ as the title says. Let your bones connect to your mind, and you’ll start to understand that the restriction, particularly in this fraught moment, extends far past the merely physical, and maybe you’ll start to consider a negotiation of another kind. Finally, through all the struggle, you arrive at “Nowhere and Everywhere at the Same Time No. 3,” a two-tone symphony performed by a robotic grid swinging a web of diamond-shaped pendulums at varying paces. Finally: This is easy, you might think to yourself, as you bob and weave your way from one side to the next. Forsythe might be less sure. As an arc of experience, “Choreographic Objects” takes note, one person to the next, of what you can and cannot do, and in ways that sink in later that are about far more than muscle strain. You leave gently disrupted, with the realization that Forsythe’s canvas, ultimately, is you. 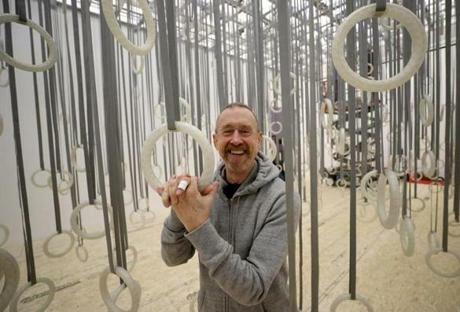 Artist William Forsythe at the ICA.